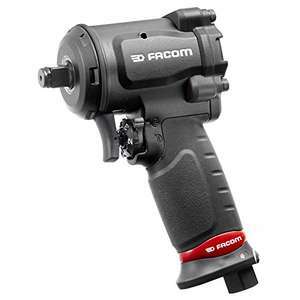 Facom good quality tools from past experience. Friend had one for using on his car builds and couldn’t believe how much power this has for its size. 3 power settings, “one hand” reverser. Supplied with hanging hook, reduces user fatigue. Monobloc body design extending its lifetime. Built-in shock absorbers protecting the tool from damage. Resists to hydrocarbons and solvents. Hydrocarbon and solvent resistant injected rubber coated aluminium grip reduces user fatigue. Delivers 635 ft-lbs, 860 N.m reverse torsion toque. Compact to enable access in difficult areas. Socket held by ball + pin. • Maximum torque 861 N.m.
Strokes per minute 1650 cpm. Idle speed 10000 rpm. • 1/2" square drive. Average air consumption 127 l/min. Min hose diameter. 10 mm - 3/8”. Used them in past and can do next day I’m sure. Usually there is a variable setting on professional tools but they can't be bothered to change it. Clarke unit is a big tool. easy to adjust air flow which will regulate torque and speed. i was well impressed with this unit and would opt for Facom over Clarke any day. Any garage that doesn't use a torque wrench to nip them up shouldn't be working on cars!!! Totally different product, I've owned a clarke one in the past too and it was garbage. I have a lot of clarke tools and most are good but this is not comparable, For a start it's twice the size and three times the weight, it only has 680nm compared to this beast having over 800. Air pressure is set by an air regulator not the tool itself. Imo, power settings are not really necessary, the torque applied gradually depending how long you hold the impact action. If exact torque is important, torque bar should be used anyway, as others said. Impact wrenches are more useful to undo bolts. Very good price by the way, if I didn't had two IR already, Id have grab one. Pwel to right on torque wrench. Scares me to think people not use them on wheels. Next day delivery as well in link. 127lt per min average air consumption = 4.5 cfm. So you would need at least a 9 cfm free air delivery compressor to run this gun for more than a few seconds at full power (depends on size of air receiver to a degree). But you need a pump that will keep up with its air demands....at least a 3 hp bare minimum. 127lt per min average air consumption = 4.5 com. So you would need at …127lt per min average air consumption = 4.5 com. So you would need at least a 9 com free air delivery compressor to run this gun for more than a few seconds at full power (depends on size of air receiver to a degree). But you need a pump that will keep up with its air demands....at least a 3 hp bare minimum. 127lt per min average air consumption = 4.5 cfm. So you would need at …127lt per min average air consumption = 4.5 cfm. So you would need at least a 9 cfm free air delivery compressor to run this gun for more than a few seconds at full power (depends on size of air receiver to a degree). But you need a pump that will keep up with its air demands....at least a 3 hp bare minimum. Yes, perfect......but just make sure you run that screw compressor hard or you will find that you get a condensation problem in the screw and oil and water mixing, resulting in screwed screw. I have one of these and run it on a 70year old ingersoll rand compressor with a 1 1/2hp (when it was new) motor and it runs it fine.... no problem at all!